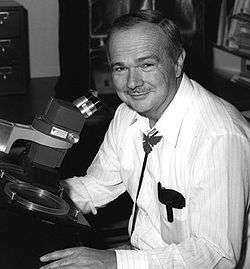 Eugene Merle Shoemaker (April 28, 1928 – July 18, 1997), also known as Gene Shoemaker, was an American geologist and one of the founders of the field of planetary science. He is best known for co-discovering the Comet Shoemaker–Levy 9 with his wife Carolyn S. Shoemaker and David H. Levy. Shoemaker was born in Los Angeles, California, the son of Muriel May (née Scott), a teacher, and George Estel Shoemaker, who worked in farming, business, teaching, and motion pictures. His parents were from Nebraska. For his Ph.D. degree at Princeton (1960), Shoemaker studied the impact dynamics of Barringer Meteor Crater, located near Winslow, Arizona. To understand the dynamics, Shoemaker inspected craters that remained after underground atomic bomb tests at the Nevada Test Site at Yucca Flat. He found a ring of ejected material that included shocked quartz (coesite), a form of quartz that has a microscopically unique structure caused by intense pressure. Shoemaker helped pioneer the field of astrogeology by founding the Astrogeology Research Program of the United States Geological Survey in 1961 at Flagstaff, Arizona and he was its first director. He was prominently involved in the Lunar Ranger missions to the Moon, which showed that the Moon was covered with a wide size range of impact craters. Shoemaker was also involved in the training of the American astronauts. 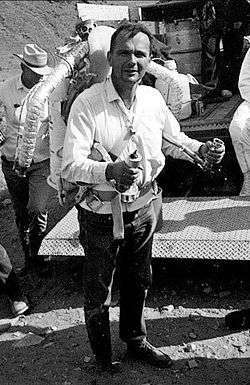 He himself was a possible candidate for an Apollo Moon flight and was set to be the first geologist to walk on the Moon but was disqualified due to being diagnosed with Addison's disease, a disorder of the adrenal gland. Shoemaker would train astronauts during field trips to Meteor Crater and Sunset Crater near Flagstaff. He was a CBS News television commentator on the early Apollo missions, especially the Apollo 8 and Apollo 11 missions, appearing with Walter Cronkite during live coverage of those flights. Shoemaker received the Barringer Medal in 1984 and a National Medal of Science in 1992. In 1993, he co-discovered Comet Shoemaker–Levy 9 using the 18" Schmidt camera at Palomar Observatory. This comet was unique in that it provided the first opportunity for scientists to observe the planetary impact of a comet. Shoemaker–Levy 9 collided with Jupiter in 1994. The resulting impact caused a massive "scar" on the face of Jupiter. Most scientists at the time were dubious of whether there would even be any evident markings on the planet. Shoemaker spent much of his later years searching for and finding several previously unnoticed or undiscovered impact craters around the world. Shoemaker died on July 18, 1997 during one such expedition following a head on car accident while on the Tanami Road northwest of Alice Springs, Australia. His vehicle and another were thought to be using the center, relatively smooth part of a heavily rutted, unimproved road. On seeing Shoemaker approaching, the driver of the other vehicle pulled hard to his left, and had Shoemaker done the same, the vehicles likely would have passed each other. But Shoemaker, as an American accustomed to driving on the right side of the road, reflexively pulled hard to his right and so directly into the path of the other vehicle. A head-on collision in which Shoemaker's vehicle was traveling at 80 km/h (50mph) and the approaching vehicle at 50 km/h (31mph) ensued in which Shoemaker was killed instantly and his wife, Carolyn, severely injured. The occupants of the other vehicle were rendered unconscious, but not seriously injured. ^ Cite error: The named reference DSPTribute was invoked but never defined (see the help page). The Near Earth Asteroid Rendezvous space probe was renamed "NEAR Shoemaker" in his honor. It arrived at asteroid 433 Eros in February 2000, and landed on the asteroid after a year of orbital study. He was previously honored with the asteroid 2074 Shoemaker, discovered and named by his colleague Eleanor F. Helin. ↑ Coroner's Report —Eugene Merle Shoemaker. Posted 2004-05-18. Accessed 2015-05-07. ↑ Porco, Carolyn. "The Eugene M. Shoemaker Tribute". Diamond Sky Productions. Retrieved 8 June 2013. ↑ Porco, Carolyn C. (February 2000). "Destination Moon". Astronomy. Retrieved 8 June 2013.